"I have tried so many versions of glazed doughnuts, and this one finally came out perfect! Just like the ones at my favorite doughnut shop." In a large bowl, mix together the yeast mixture, milk, sugar, salt, eggs, shortening, and 2 cups of the flour. Mix for a few minutes at low speed, or stirring with a wooden spoon. Beat in remaining flour 1/2 cup at a time, until the dough no longer sticks to the bowl. Knead for about 5 minutes, or until smooth and elastic. Place the dough into a greased bowl, and cover. Set in a warm place to rise until double. Dough is ready if you touch it, and the indention remains. Turn the dough out onto a floured surface, and gently roll out to 1/2 inch thickness. Cut with a floured doughnut cutter. Let doughnuts sit out to rise again until double. Cover loosely with a cloth. Melt butter in a saucepan over medium heat. Stir in confectioners' sugar and vanilla until smooth. Remove from heat, and stir in hot water one tablespoon at a time until the icing is somewhat thin, but not watery. Set aside. Heat oil in a deep-fryer or large heavy skillet to 350 degrees F (175 degrees C). Slide doughnuts into the hot oil using a wide spatula. Turn doughnuts over as they rise to the surface. Fry doughnuts on each side until golden brown. Remove from hot oil, to drain on a wire rack. Dip doughnuts into the glaze while still hot, and set onto wire racks to drain off excess. Keep a cookie sheet or tray under racks for easier clean up. 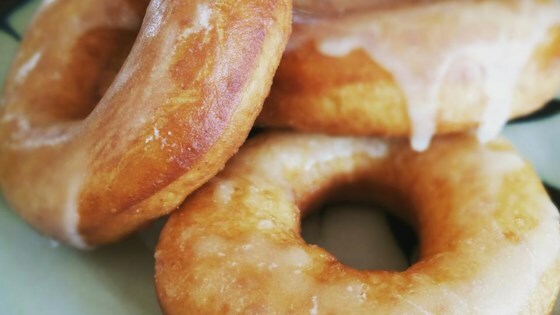 See how to make perfect glazed doughnuts.